Excellent book.Should help you think about thinking about complex decisions in a different light and hopefully better and more efficient manner. This book belongs with a bunch of similar books - Predictably Irrational: The Hidden Forces That Shape Our Decisions , Sway: The Irresistible Pull of Irrational Behavior , How We Decide , Influence: The Psychology of Persuasion , Mistakes Were Made (But Not by Me): Why We Justify Foolish Beliefs, Bad Decisions, and Hurtful Acts - that have come out in recent years that talk to basically the same theme - fallacies and shortcomings in the way we think, what drives our decision making process, and how we can become better aware of these dynamics. The main point of the book is that small actions (or inactions) can have major consequences down the road, that people underestimate the power of inertia, and that we can be gently 'nudged' into making choices that leave us better off than without. The key here is what Thaler and Sunstein call 'libertarian paternalism', that provides and preserves choice for the end-user (libertarianism) while at the same time helping and nudging the user into making the right choices (paternalism). 'Right' as in choices that leave the person better off and as measured by the user himself. How to make people save more and more efficiently for retirement, how to reduce smoking, how to help people avoid binging on credit cards, how to improve the rate of organ donations, make people eat better, improve the US medical health program for prescription drugs for senior citizens, how to reduce pollution, even marriages. Turns out all these and more could be improved via nudges. None of these topics is controversy free. Indeed, people more often than not hold very strong and definite views on these topics. They do not take lightly to even being 'nudged' towards alternative proposals. It is likely inevitable that suggestions, proposals, and arguments put forth by the authors will make some readers see a hidden political agenda or unwanted insinuations. To the authors' credit, they try, conspicuously, to avoid taking political stands, and make sure to avoid criticisms that could be interpreted as political. They succeed, mostly. I will leave it to you, the reader, to read the book and figure out which way they lean, or seem to lean. This judgment will, I suspect, be based in large part on your own political inclinations. Disclosure is akin to sunlight - just as sunlight disinfects, the light of disclosure can itself weed out many undesirable practices. Although rules of thumb can be very helpful, their use can also lead to systematic biases. This insight, first developed decades ago by two Israeli psychologists, Amos Tversky and Daniel Kahneman (1974), has changed the way psychologists (and eventually economists) think about thinking. Their original work identified three heuristics, or rules of thumb - anchoring, availability, and representativeness - and the biases that are associated with each. ... when asked to judge how likely it is that A belongs to category B, people answer by asking themselves how similar A is to their image or stereotype of B. Leaving the gas cap behind (when refueling at a gas station) is a special kind of predictable error psychologists call a 'postcompletion' error. The idea is that when you have finished your main task, you tend to forget things relating to previous steps. In the case of ATM cards, we have ATM machines that beep very loudly should you leave the card behind, or in some cases first require that you remove the ATM card before the cash is dispensed. For car fuel caps, the fuel cap is now attached to the fuel tank, so that the chance that you will leave it on the hood of the car are almost zero (unless you happen to break the cable connecting the cap to the tank). When we face a small number of well-understood alternatives, we tend to examine all the attributes of all the alternatives and then make trade-offs whenever necessary. As we have seen, people are most likely to need nudges for decisions that are difficult, complex, and infrequent, and when they have poor feedback and few opportunities for learning. Pollution is an example of a topic where decisions taken today have consequences far out in the future. This is one situation where people will find it difficult to make choices that leave them better off. Also, the belief is that their action - of polluting - , taken individually, has too small an impact to have any consequence. Perhaps. But when taken in the aggregate, it can lead to catastrophic results for the environment in the future. Another example is smoking, where the action of smoking is in the present, but the consequence, an increased probability of developing cancer, is so far out in the future, that self-serving biases spring up, making good decision making almost impossible. The presence of hundreds of millions of smokers worldwide is proof that people have difficulty in making the right decision. People who celebrate freedom of choice are well aware that when 'transaction costs' (the technical term for the costs of entering into voluntary agreements) are high, there may be no way to avoid some kind of government action, even of the coercive kind, When people are not in a position to make voluntary agreements, most libertarians tend to agree that government might have to intervene. 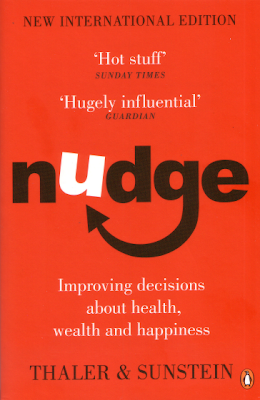 Nudge-Richard H. Thaler-Penguin Books India - available at a list price of Rs 299.